Random House Trade Paperbacks, 9780679783480, 416pp. This is the story of Maximilian Ophuls, America’s counterterrorism chief, one of the makers of the modern world; his Kashmiri Muslim driver and subsequent killer, a mysterious figure who calls himself Shalimar the clown; Max’s illegitimate daughter India; and a woman who links them, whose revelation finally explains them all. It is an epic narrative that moves from California to Kashmir, France, and England, and back to California again. Along the way there are tales of princesses lured from their homes by demons, legends of kings forced to defend their kingdoms against evil. And there is always love, gained and lost, uncommonly beautiful and mortally dangerous. Salman Rushdie was born in 1947. He is the author of eight previous novels: Grimus, Midnight’s Children, Shame, The Satanic Verses, Haroun and the Sea of Stories, The Moor’s Last Sigh, The Ground Beneath Her Feet and Fury. He has published a collection of short stories, East, West, a book of reportage, The Jaguar Smile, two collections of essays, Imaginary Homelands and Step Across This Line, and a work of film criticism about The Wizard of Oz. Salman Rushdie’s second novel, Midnight’s Children, was awarded both the Booker Prize and the “Booker of Bookers,” as the best novel to have won the Booker Prize in its first 25 years. His other accolades include the Whitbread Novel Award, the Prix du Meilleur Livre Etranger, the James Tait Black Memorial Prize and the Austrian State Prize for European Literature. Salman Rushdie lives in London and New York. "A sprawling tale of love and politics. . . . A daring aesthetic and political balancing act that traffics in many of the major concerns of post-colonial literature, but always within an evolving and bravely empathetic story. . . . One of Rushdie's best, and an important and rewarding must-read." 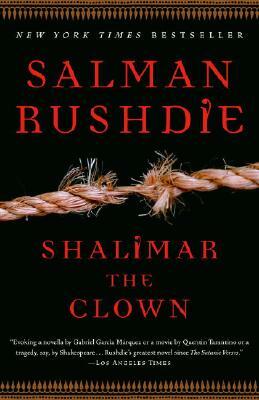 "Read Shalimar the Clown for the effervescent fun factor that is always present in Rushdie's work. . . and for its devastating portrait of the destruction of Kashmir." "[Shalimar the Clown] is that rare highwire act, a literary thriller. It seems a vigorous rebutal to the recent dismissal of fiction by V. S. Naipaul, to the effect that 'if you write a novel... it's of no account.'" "Our most exhilaratingly inventive prose stylist, a writer of breathtaking originality. . . . He has become, as much for his convictions as for his creativity, the finest English writer of India." "With Rushdie one is always in the presence of a true original. . . . More than any other contemporary English writer, Rushdie makes the page sing with his prose." "A great novelist, a master of perpetual storytelling." "An exhilarating read. . . . One page of Fury is worth a thousand pages of the grey, risk-averse prose that passes so often for contemporary literary fiction." "A beautifully written and carefully constructed novel. . . . [Fury] ricochets back and forth between well mannered realism and [Rushdie’s] own brand of what might almost be called surrealism — manic, absurdist, biting, over-the-top and very funny."